Birmingham City University’s Royal Birmingham Conservatoire will be presenting a star-studded double bass benefit concert next month, as the institution hopes to raise funds for its growing distance learning programme with a township in South Africa. Bass Extravaganza takes place on Tuesday 6 November and is being headlined by New York Philharmonic Principal Double Bassist, Timothy Cobb. A native of Albany, New York, Cobb graduated from The Curtis Institute of Music, where he studied with Roger Scott. Cobb has been designated a UNESCO Artist for Peace from his affiliation with the World Orchestra. Timothy Cobb can be heard on all Metropolitan Opera recordings released after 1986, as well as on a recording on the Naxos label of Giovanni Bottesini’s duo bass music with International Chair in Double Bass at Royal Birmingham Conservatoire, Thomas Martin. Cobb and fellow American bassist Martin will be performing together once again as part of Bass Extravaganza. Founded in 1842 and one of the ‘Big Five’ leading American orchestras, the New York Philharmonic is based in David Geffen Hall, located in New York’s Lincoln Center for the Performing Arts. 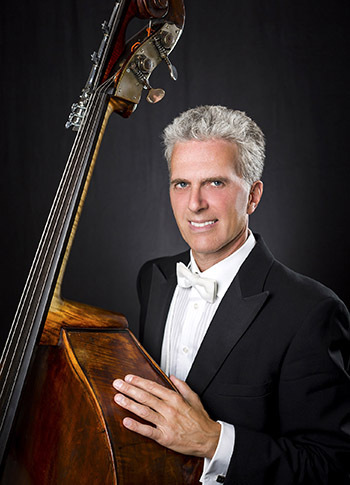 Timothy Cobb joined the New York Philharmonic as Principal Bass in May 2014, after serving as Principal Bass of The Metropolitan Opera Orchestra, and Principal Bass of the Mostly Mozart Festival Orchestra since 1989. “There are few greater pleasures for a musician than to visit other countries and regions of the world and share in the delight of performing and studying great music. And, when the experience includes spending time with a long-time friend and top artist like Thomas Martin, as well as performing in a wonderful benefit for South African bassists, it becomes what I know will be a fantastic event and a treasured memory!" Helping to bring music, and the unique joy of the double bass to other parts of the world is a gift and huge honour, and I am delighted to be part of this wonderful evening! Tom and I spent some arduous hours recording the Bottesini Double Concerto, and I am very excited to play together again! One of the world’s best-known bassists, Thomas Martin studied in his native America with Roger Scott. He has held front desk positions with the Buffalo Philharmonic and Israel Philharmonic Orchestras and Principal positions with l’Orchestre Symphonique de Montreal, The Academy of St Martin-in-the-Fields, the English Chamber Orchestra, City of Birmingham Symphony Orchestra (CBSO) and latterly, the London Symphony Orchestra. “Music truly is the international language and I have had the pleasure of performing with people from all around the globe, many of whom I could not have conversed with otherwise. Therefore, it seems rather fitting that our event will help us support friends on the other side of the world through our joint love of music and desire to nurture the next generation of double bass talent. The duo will also be joined by Tony Alcock and Damian Rubido Gonzalez – respective Double Bass Section Leader and Sub-Principal Double Bass at CBSO – alongside students from Royal Birmingham Conservatoire’s Strings Department. The concert will include works by Niccolò Paganini and Sergei Rachmaninoff, and proceeds raised will be donated to the South African Youth Orchestra Foundation so that it can host its first ever course exclusively for the double bass in Cape Town in December this year. There are relatively few opportunities for young bassists in South Africa, so the Foundation is hoping this will help to develop a strong bass community within the country. One such student hoping to benefit from this course is 17-year-old Njabulo Nxumalo from Soweto in Johannesburg. 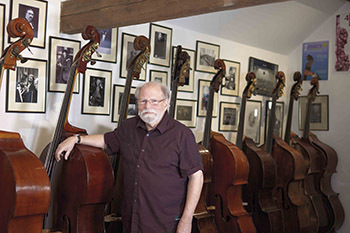 He is the first double bass student to be enrolled on the collaborative UK-South African project, Cape Gate MIAGI Centre for Music & Birmingham Conservatoire – or ARCO, which is also the name for the technique of playing a stringed instrument with a bow. ARCO has seen 24 strings students aged between eight and 17 in South Africa selected to participate in weekly instrumental Skype lessons, given by academics, current students and alumni of Royal Birmingham Conservatoire. ARCO aims to provide the benefits and life changing inspiration of music to children in the most deprived of circumstances. 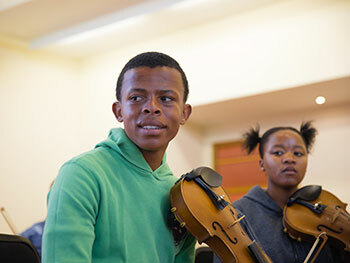 As well as providing transformative music education activities, Conservatoire staff and students have been acting as role models for vulnerable youngsters living in Soweto, a township deeply affected by poverty and crime. Tickets can be purchased via Eventbrite or donations can be made directly to the South African Youth Orchestra Foundation’s Double Bass Course through GivenGain.